Presenting wine at a party or a gathering can be embarrassing if you have to bring it in an ugly brown sack. Stay classy and bring it in a beautiful leatherette tote instead! It will be the perfect thing for your next party or even next host / hostess gift. 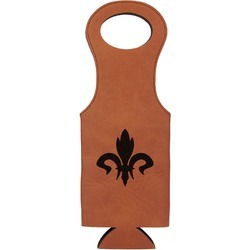 This gorgeous little wine tote will bring admiration from everyone! The tote is made of a beautiful cognac brown leatherette material with strong black stitching along the sides for extra durability. On the inside you will find a padded black material to keep your wine safe. The two handles at the top are an elegant oval shape that look very attractive when in use. If you ever need to clean your leatherette, we recommend using a damp cloth with a small amount of soap to clean the dirtied areas. Dry with a cloth promptly afterwards. Your personalization will be laser engraved right onto your tote, resulting in a black color. This is a sharp look on the leatherette. Pick a fun saying, font, or monogram to show off your personality a little. Whatever you do, make it you. Let us know if we can help at all! Be sure to stop by our Bar and Wine section before you go. You'll find everything you need like corscrews, wine glasses, and a complete wine tools set. Have fun designing your whole bar!